For those of you that don’t know, Saturday, 16 September is Mexican Independence Day. Every year, the Embassy of Mexico in Pretoria throws a special celebration for the Mexican community and some specially-invited local guests. This year, Hector decided to contribute with a special dish for the event – a fresh Nopales salad!!! Nopales are the young and tender paddles of the prickly pear cactus. They are an essential part of authentic Mexican cuisine. The cactus is even on our flag! Don’t let the prickly exterior scare you – nopales are a delicious and healthy ingredient. Late last year, Hector was put into contact with a young farmer and his wife – Marcell and Diva Linde. 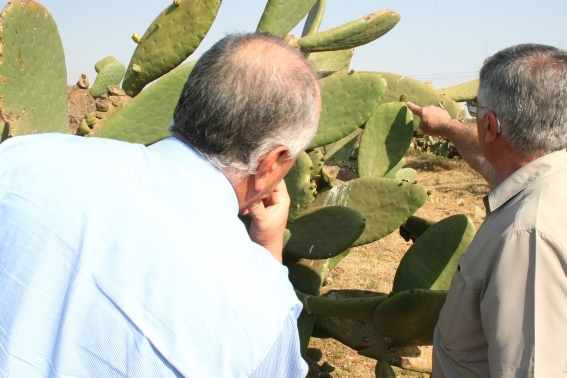 They have been working on developing a customer base for fresh nopales in South Africa in order to develop another revenue stream for their family’s farm. For Mexicans in South Africa, it is an exciting prospect to find this ingredient fresh. 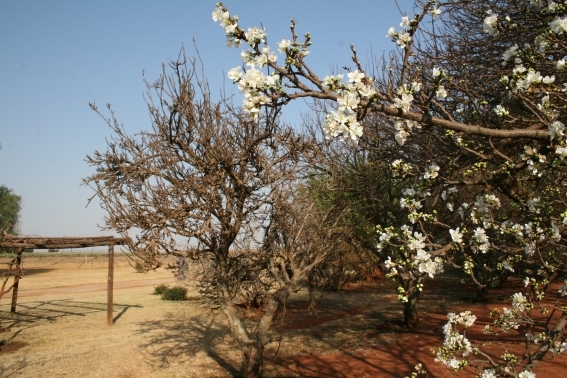 September marks the beginning of spring in South Africa and the beginning of the season for nopales and cactus pears. 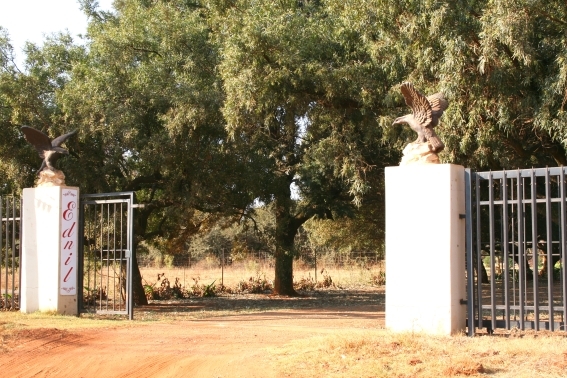 The entrance to Ednil Cactus Pear Farm. 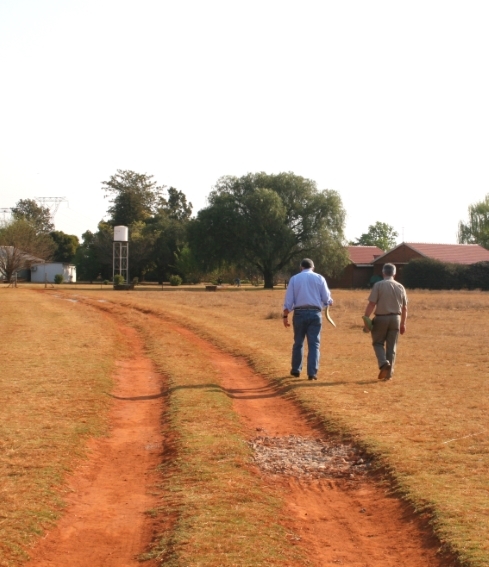 Hector went to the farm – based just outside of Johannesburg – to check it out. Unfortunately, Marcell was right and the nopales weren’t even close to ready, but Hector did learn quite a lot about this humble cactus. Martin showing Hector a young cactus pear. The young nopal (left) is flatter in shape than the young cactus pear (right). 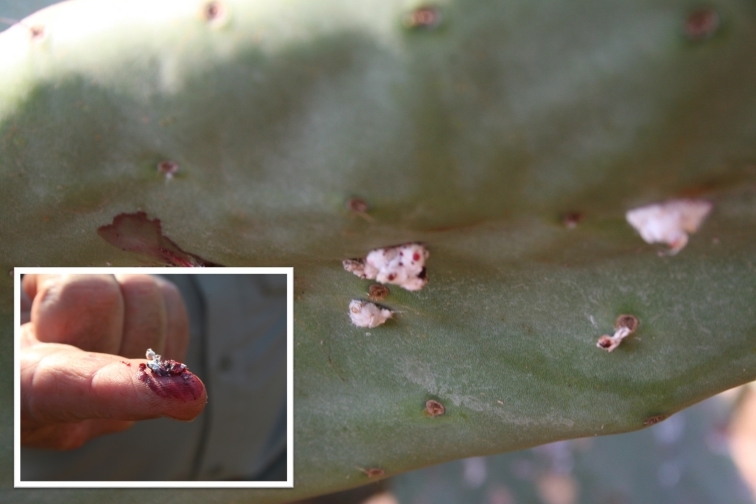 He also described some of the pests that attack his plants – such as the cochineal bug which was introduced to South Africa to control the wild prickly pear population that was once over-populated in wild areas due to a lack of naturally-occurring parasites. The cochineal bug is sometimes used itself to make red food dyes as it contains a deep red pigment. A Cochineal bug infestation and the red liquid that the bugs contain. Hector leaving Ednil with some leaves to grow his own cacti. Thank you to Marcell and Martin for their hospitality and delicious cactus pear juice samples! 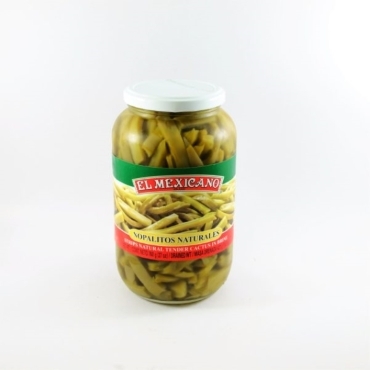 We look forward to trying your nopales later in the season in our Nopales Salad Recipe. Hi do u sell fresh cactus pear leaves? Direct to public? If so, how much and where are u based(address)? Nopales are the young leaves of the prickly pear cactus that are still tender. Unfortunately, this means that they are seasonal (Late October to early January). We do have some of the fresh cactus leaves from this past season that have been chopped, boiled and frozen available at our factory shop in Midrand for R28.50/250g. Hi Gaby. My nsme is Tsatsi. I am interested in your nopsles. Ii am in Bloemfontein and I was wondering if you courier orders if people wish to buy from outside Midrand. Hi Gaby. I am aware that you sell nopal cactus. I am interested in buying some but I liver in Bloemfontein and I was wondering if you wiuld courier my order since I am outside Midrand. We can courier products to you if you order them through our website. The courier charge to Bloemfontein is currently R90.00 for a standard parcel of up to 15kg. I’m also in bloemfontein. But I would like to know if you guys sell the nopal catcus as dried herbs?